The leaves are all gone from the trees and today, we are finishing up the last of the fall clean up. We heard on the news this morning that the first snowfall is in the forecast for morning. I know it will not stay but snow? in October? Well, the hunters will love it. Yesterday was even more incredible reflections of color on the lake. I did some panoramic shots and below are 3 that I put together. I wish I both had more time and patience to combine them better but I think you get the jest. Every fall, I see the colors change but there are none better then seeing them as they reflect on a calm quiet lake. I took this shot this morning. I went to Augusta yesterday to help out at the MSA show and on the way home, I realized, we are at peak foliage up here, if not just past it. What an incredible drive up 201 it was. The trees started showing their colors in Skowhegan, maybe sooner but this is when I started to noice them. As I got closer to Jackman, the colors became much more bold and rich. It was most noticeable was when I hit Johnson Mountain…the forests on both sides were filled with reds, oranges, yellows, that okra color, burnt oranges with the deep dark greens from the pine and spruce mixed in between. Of course, at that point the skies were blue which added just another dimension in it all. When you got to the top of the mountain, you could see that many leaves had already fallen and most of the colors were green. And then coming back down the mountain, the trees had their leaves and the rich golden colors of autumn returned. As I passed Parlin Pond, the waters were still as glass and the multitude of color from the trees on the other said of the pond were echoing on the pond. It was kinda hard to drive and look but I managed. And of course, I did not have my camera with me. That was definitely a Kodak moment! I did stop at the Attean overlook though, Along with 10 other cars…to take in the valley and mountains beyond. So if you are heading up to Jackman to see the foliage, unless you leave today, I fear you may miss it. This week the leaves have really started to turn. When I was young, I was always told that they change color after the first frost. I do not believe we had a hard frost yet, although in the mountains they may have. But also, I read that the green goes away in relation to the amount of daylight. SO what is the facts?. I guess I need to “”google”” that! Whatever the facts are, it is still a beautiful time of year. Everyday, I see more and more shades of reds and oranges popping all over. 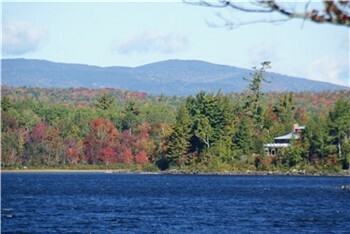 This shot was taken overlooking Big Wood Lake with I believe Bald Mountain in the background. We took a ride too today to explore the color and they are definitely out there but I think this is a prettier shot but then again, I am a little partial to the lake view. It cannot be time for fall foliage yet, can it? We had to go to Greenville yesterday to take Murphy to the vet (that is another story) and I could not believe my eyesÃƒÂ¢Ã¢â€šÂ¬Ã‚Â¦on the way to Rockwood, the leaves were already starting to change. Isn-t this still August? Maybe this means an early winter? August 31…Well, yes, our red maples here at Cozy Cove Cabins are also starting to turn. I guess I just did not notice that. I think I can officially say the peak fall foliage is over….Well Over half the leaves on our trees have fallen. Today, Steve, Linda and myself, started the task of raking and picking up the leaves. Oh JOY! ❗ We know this is the first of many days of raking but are taking advantage of having his sister around to help. 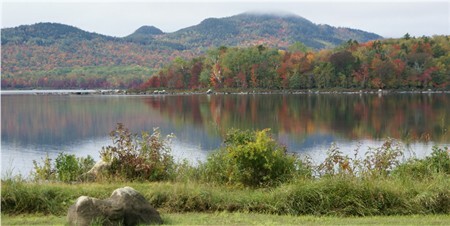 Peak foliage here in the region is usually the 1st week in October, but it may be sooner this year! I cannot believe that some leaves are beginning to change already, especially the red maples. Pretty soon, the colors of orange and yellow and red will be mixed into the ever green of the pines. All this against the blue clear skies. I CAN-T WAIT 😛 as this is my favorite time of year.